The Rye High boys? basketball team made it three straight years as Kings of the Hill in Mamaroneck, sweeping past Ardsley Friday evening and the host Tigers Saturday afternoon to successfully defend their hold on the Tiger Tournament silverware. Two years ago, Head Coach John Aguilar?s Garnets thrashed Elmsford?s Hamilton High by 25 before beating the hosts in a double-overtime thriller. Last year they flipped the script, drubbing the Tigers by 53-34 before winning the final by 10, 43-33. After that game, Coach Aguilar praised his team for playing, ?the best D I?ve ever had here in my years of coaching.? The defense this year might be even better. 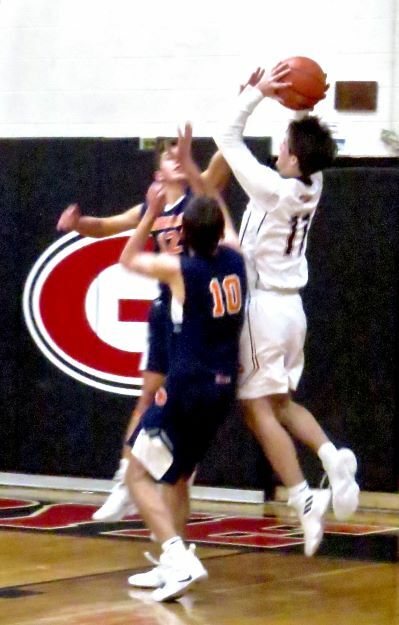 Friday evening saw the Garnets brush aside an outgunned Ardsley team, 61-39. All by themselves, guards Quinn Kelly (24) and Matt Tepedino (18) outscored the Panthers, thanks to a team defense that switched from zone to press and back again faster than their Class B foes could figure it out. Saturday?s game, against a much tougher 11-3 Class AA team, was even more of a Kelly-Tepedino party. Matt Tepedino, the MVP of last year?s tournament, hit 17 points along with four assists and three steals in Rye?s 62-41 victory. But it was Kelly?s afternoon, with five rebounds and four assists to go with a game-high 28 points. Both Rye guards would make the All-Tournament team, as much for their smothering defensive play as for their scoring?holding the Tigers 15 points below their season?s average. This year, the MVP award went to Quinn Kelly, he of the long sleeves. Ryan Lopp, yet another Garnet football player-turned-basketball star, grabbed 10 rebounds in the title tilt. Quinn Kelly, he of the long sleeves, had an MVP weekend.